During our 25 years of success, Handcrafted Metal has learned to make Custom Range Hoods in variety of styles and metals such as copper. 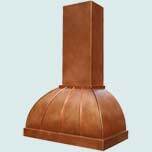 Our custom Copper Range Hoods offer warm colors and a broad selection of shapes and styles. Our fine French Brown patinas and Old World colors provide a wealth of choices to make your copper range hood blend with your kitchen or stand on its own as a dazzling focal point for your kitchen vent. For metal quality and durability, each copper range hood is and made with the purest copper available. To fully accommodate your kitchen, you can completely customize every dimension and feature, and all seams are fully welded and polished. You can also add detailing, such as hand-forged straps and rivets, to give your copper hood a powerful presence in your kitchen. We will work with you to produce a work of art for your kitchen vent requirement. We offer both copper wall hood and island copper hoods in different hammering option and finishes such as copper antique patina finishes. To get started, click any of the Copper Range Hoods styles below to see a collection of custom copper hoods that we have made in that style. You can then click any of the copper range hood displayed to see pricing and customize dimensions and features. French Country copper range hoods style is one of the most popular style among all different shapes and designs of copper hoods that we have today. Single Roll Copper Range Hood style is a very popular vent option for kitchens, if we want to have it installed on the Wall. Wing Style Copper Range Hood is another very popular design, its round stacks gives a beautiful look to you kitchen, copper adds its own dazzle to it. A good style for high ceiling houses. French Roll Copper Range Hoods style is one of ours popular style is a unique blend of popular French Country design with rolled fronts and sides. This traditional Eyebrow Range Hood style in copper has been an old favorite, which still enchants those who looks for stylish decorative venting option. 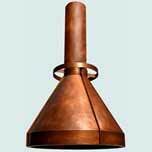 The classic Pyramid Copper Range Hood style has been one of the most simplest and popular Copper Hood design. It gives a powerful presence to your Kitchen. 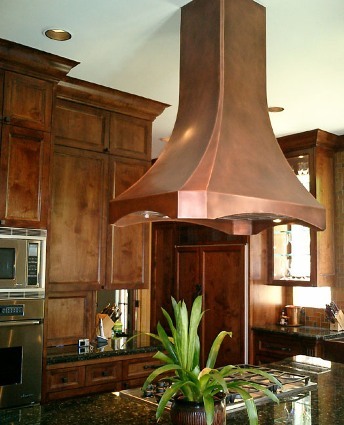 This Double Sweep Style Copper Range Hood is one of the most symmetrical Copper Hood design. This can provide powerful presence in your kitchen. We have got approx 30 designs of Copper Range Hoods in Double Roll Style.Some of the Old World Patina finishes in this style looks surreal. Sweep Front style is one of the most popular stylish copper hood design. This is the ideal option if you want to install it as a Copper wall hood. French Bell Copper Hoods are one of the most stylish range hoods when crafted in copper, Our beautiful designs have provided breathtaking looks to many kitchens. 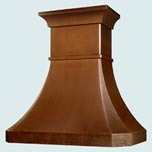 The Venice Style Copper Range Hood is a design masterpiece, real hard to craft but its worth putting the effort. Tall French Country Style in Copper Range Hood is a good option for kitchen which have high ceilings and yet want a powerful presence in kitchen. If your ceiling is very high then Tall French Sweep Style in Copper Range Hood can be a good option. The stacks looks a part of the Hood. Our Classic Tudors Copper Range Hood gives glimpses of old English royal kitchens. With our design, this style can have many decorative options. The Ultra Low Profile Range Hood style is an ideal island copper hood to cover a BBQ grill and prep areas on each side. Spherical Style range hoods in copper metal gives an oriental Royal look to your kitchen vent. 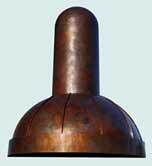 Copper Range Hoods Conical Style are normally used as fireplace hoods and crafted with thick copper sheet metal. The Cylinder style Copper Hoods style can be designed for any proportioned to reach any ceiling and cabinet space, ideal for large kitchen. Handcrafted Metal takes pride in our very high quality craftsmanship. 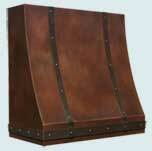 We see your Custom Copper Range Hood , order as an opportunity to deliver our uncompromising design and craftsmanship. 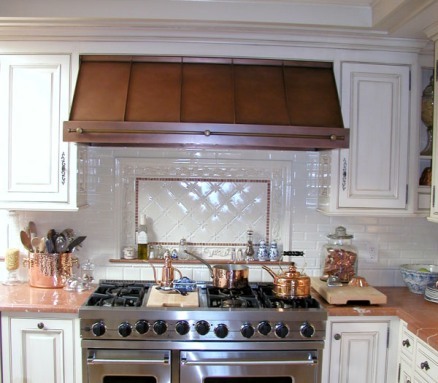 You can see that we offer a large number and an amazing variety of Copper Range Hoods designs for your kitchen vent. Our 25 years of experience in building Copper Range Hoods in every size, shape, and color gives us mastery of the essential methods, processes, and skills needed to produce a copper vent hood that exceeds your expectations. We have built thousands of custom copper hoods in all kind of metals including copper. The vast array of styles, finishes, textures, and metals available for Handcrafted Metal custom copper hoods provide almost unlimited choices. Powerful Presence:-- Copper provides a powerful presence to your kitchen. The kitchen is the heart of your home; you want it to be a place you can be proud of. This is why if you want your kitchen to represent your personality then range hood made in copper should be the choice of metal for your kitchen vent. Antimicrobial Properties:-- One of the benefits of copper is their anti-bacterial properties. You can dramatically reduce the risk of bacteria by using a copper range hood in your kitchen. Living Finish:-- Copper is called a "living finish" and when left bare to the elements, will take on a patina over time as it darkens from it's polished pink hues to a more caramel brown. they change color over time, but and this adds character to the copper range hood. If you really don't want your copper ventilation hood to change color, you just have to treat it every so often by polishing and waxing it. Texture and Finish Varieties:-- One of the main advantages of copper as range hoods metal is that it has the widest available finishes and texture. Handcrafted Metal gives you the widest possible range of Patina Finishes and colors from natural pink all the way to dark warm brown espresso, and many bright colors in between or dazzling old world copper finishes and copper antique finish, with textures ranging from smooth to hammered one of our specialties is Rays Hammer. Durability of Copper:-- Copper is known for being durable. The copper metal is strong and since we use 16 gauge copper, which is not easily damaged by moisture and smoke. Because of this, if you install a copper vent hood in your kitchen then it will last you for a long time to come. Once you buy a Copper hood for your kitchen then you will probably never have to buy a copper stove range hood again in your lifetime. Design versatility:-- Copper Range Hoods for your stove provide you with versatility and flexibility since it is more malleable then other metal, it offers more design options . They don't only come in a choice of sizes, but they come in various colors, designs and styles, enabling you to find that perfect match to blend into your kitchen space with ease. You can choose the depth, the overall design and then ensure it works with the rest of your space, helping you design your dream kitchen with ease. General Care & Cleaning:-- All Handcrafted Metal copper products should be cleaned only with non-abrasive soaps and a soft cloth. (Ivory, Dawn, etc.) No coarse, acidic, or alcohol-based cleaners should be used. Steel wool, Brillo pads, and wire brushes may scratch copper surfaces and should be avoided. Our Range Hoods in Copper are made from the finest quality of copper metal available. The "Antique" and "Old World Patina" finishes are created by a classic "hot" process and will change over time, developing more interest and variation. We recommend a regular application of protective wax be applied to these finishes. Additional Care Instructions:-- As needed, you can apply Trewax® or a polish-free furniture wax as a protective coating to your copper kitchen range hood. Natural copper and high-polish copper finishes will naturally patina, but can be easily restored to an original luster by using a brass/copper polish such as Wright's Copper Cream. Trewax can also be applied to high-polished or natural copper surfaces to reduce the appearance of natural patination. 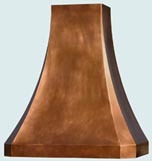 We offer an extensive selection of Copper Range Hood styles in variety of finishes, textures and customized features. Just browse any copper hood styles to see hundreds of different hoods products in Copper. We’re glad to answer any questions about any of our custom copper hoods products. Call 1-800-755-0310 to speak with a product specialist who will help you find and configure your ideal copper vent hood. 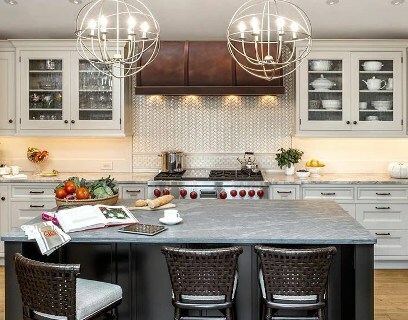 Handcrafted Metal Custom Range Hoods are built to be the focal point of your kitchen.